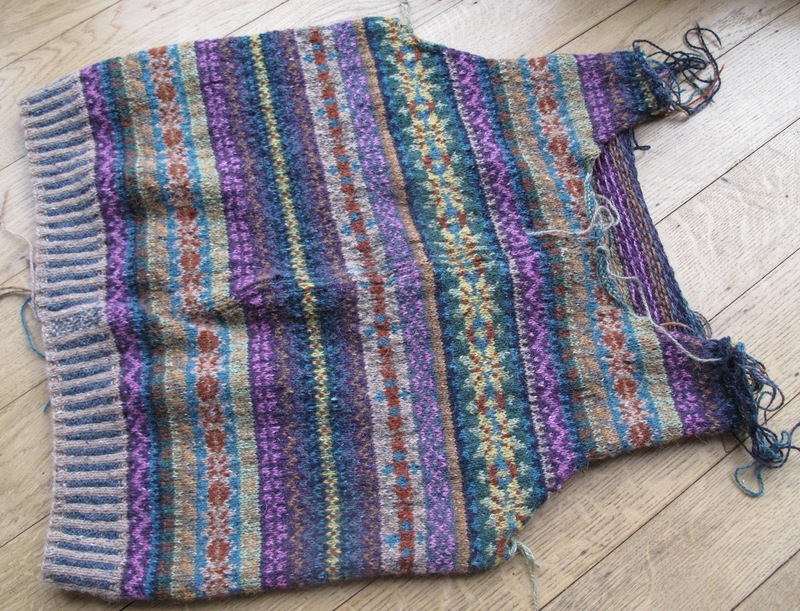 I have finished the body of Orkney, Marie Wallin’s fantastic design from Rowan magazine 52. I can honestly say it worked up so much quicker than I expected and I am really pleased with it. I know it has been a while since my first post but I had a few commissions to get out of the way. This post will cover the armholes and the neck shaping. The reason we create a steek in what will become the armhole is so that we can continue working in the round for as long as possible. 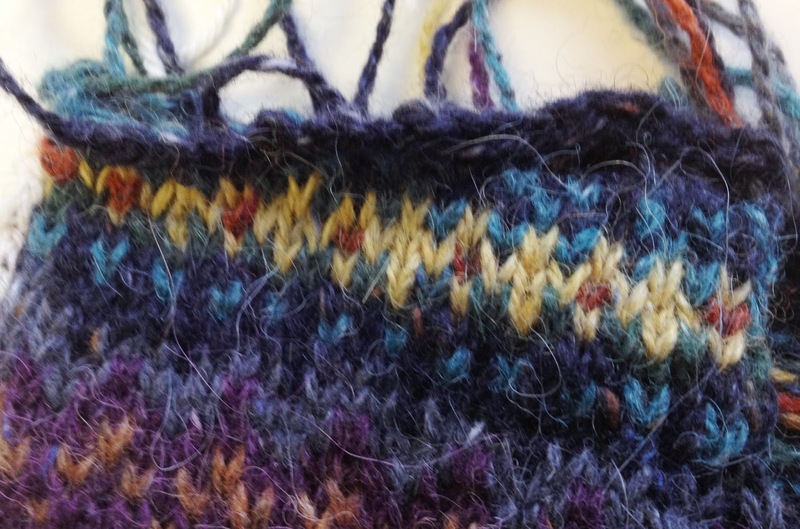 Most armholes in normal patterns follow a standard formula: cast off a number of stitches at the beginning of 2 rows, decrease each row for a certain number rows followed by a few more decreases every other row. In this pattern (in my size) each side has a 7 stitch cast off giving you a total for one size of 14 stitches for each armhole. So for my size and starting at the front I knitted 64 stitches (71st in the front -7=64), cast off 14 stitches and then, using the thumb method I cast 5 stitches back on to create the steek. Knit 122 across the back (136-14=122), cast off 14 and cast 5 stitches back on again for the other steek. Finally knit 64 across the other front to the front steek. Now you can simply follow the sleeve shaping as written in the pattern, decreasing in the stitches either side of the steek. I tent to place a marker at each side of the steek to make sure I know where I am. The most complicated part of transposing the pattern into the round is working out where to start your front shaping for the neck. 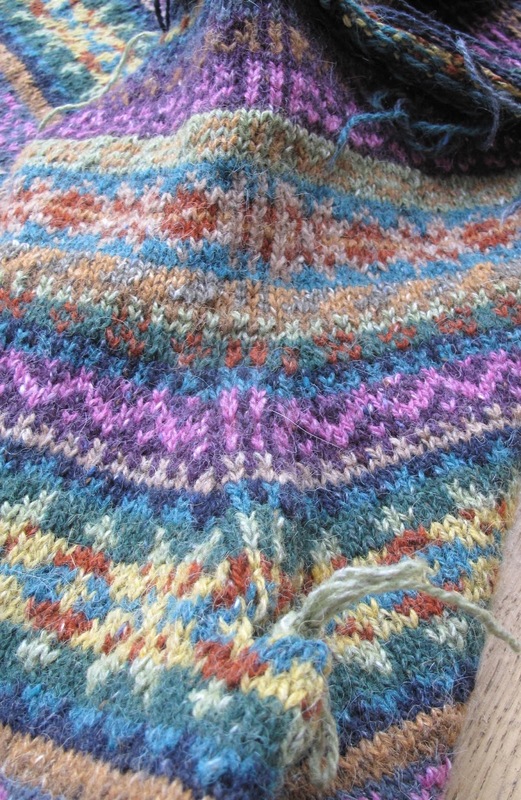 Orkney asks you to knit for 22cm from the armholes on the back in my size, and 26 rows less for the front. The given tension means there are 64 rows to the shoulder shaping and then 6 rows of shoulder shaping giving you a total of 70 rows. So this means you only need to work 44 rows on the front before you start the shaping (70-26= 44). Unfortunately when you start to shape the front it means you can no longer knit in the round but I have been quite keen to learn to knit 2-handed Fair Isle on the purl stitches. pattern. 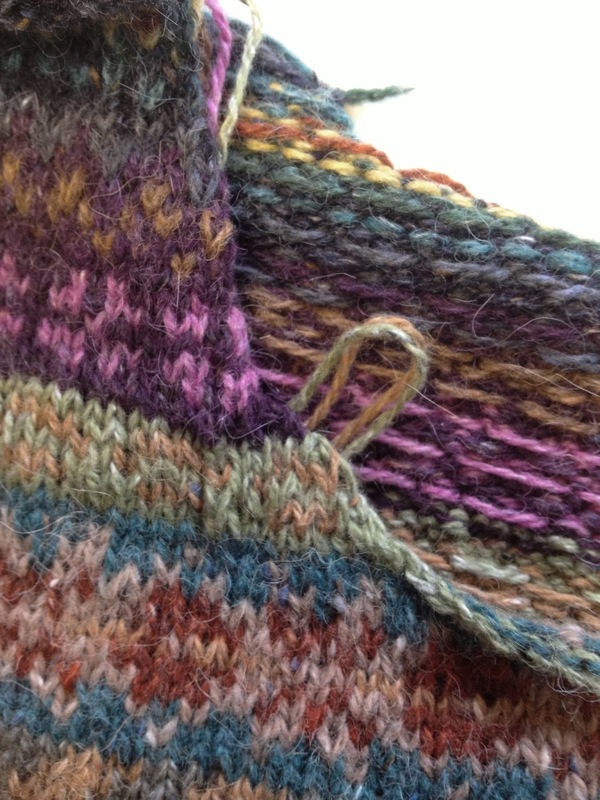 For the next row knit 8 sts, wrap and turn purl to end. Then knit all stitches picking up wraps before casting off all 24 sts. This gives a nicely sloped shoulder that is easy to join. My next post will look at the sleeves and cutting the steeks. EEEK!!!! This is a lovely clear explanation. It's a shame so many Fair Isle patterns are published for knitting flat when knitting Fair Isle in the round is so much easier. Thanks for this – time I learnt steeking! And it is IMPOSSIBLE to knit Fair Isle except in the round!! Thank you so much. I started this cardigan in the round on the advice of a Rowan rep in a John Lewis store. I reached the armholes and realised I didn't really know what to do next. Thank you for posting this information.